– Comprising Carroll, Castilia, Darlington, Forbes, Hamilton, Lake George, LaRoche, Platte, and Signal Townships – Compiled and editid by Adeline S. Gnirk, Burke, South Dakota. Al the request of the Platte Charles Mix County Genealogy Society. Published in 1985 by Gregory Times-Advocate, Gregory, South Dakota. was born February 4, 1880, to Martin and Tryntje Koopal in Vrouwen Parochie, the Netherlands. He grew up in this area and worked as a farm hand. He met Anna DeBoer from Hylaard, the daughter of Wybe Kornelis DeBoer and Rigtje (Jacobs) Vellinga, who was born August 5, 1881. Sybrand and Anna married on April 2, 1903. Four children were born while in the Netherlands: Martin, Wybe, Tryntje, Cornelius, and another son, Sjoerd, was born at Platte, South Dakota. Sybrand served one year in the Holland army before moving his family to South Dakota in 1910 and settled in a small log cabin along Platte Creek in Hamilton Township. About a year after living in South Dakota Anna died leaving Sybrand with five children (eight years to one month of age). After their mother’s death, Cornelius (Case) and Sjoerd (Anton) were taken by Anna’s sister, Annie and her husband Rein Talsma, to Matlock, Iowa. Later they were adopted by Rein and Annie Talsma. Case kept the Koopal name but Anton changed to Talsma. The boys grew to manhood there and married girls from that area. Case later moved his family of three boys to Lyle, Minnesota. He and his wife have both died there. Anton and his wife have one son and two daughters and still live on their farm near Matlock, Iowa. Martin (Mert), Wybe (William) and Tryntje (Tren or Katherine) stayed with several families in the area southwest of Platte until they grew up. Martin lived his entire life in the Platte area. William never married and worked at various jobs and is now retired in Boise, Idaho. Tren married William Markus a carpenter from the New Holland, South Dakota area. They lived in Todd County, South Dakota; California; and Idaho and retired in Nampa, Idaho, where William died. Tren and William had eight children (five boys and three girls). Tren later married DeLoss Dunn and still lives in Nampa. very few hunters ever left without having a cup of coffee. Sybrand died November 9, following a stroke in August 1954.
went back home to farm with his father until April 12, 1928 when he married Jennie Dykema, daugther of John and Grace (Hiemstra) Dykema. Martin started farming on the Beltman Brothers ranch southwest of Platte. In February 1929 their son John was born there and the following year they moved to a farm in Signal Township near the beginning of Cedar Creek. A daughter, Anna, was born there in 1932. In 1933 the Koopal family moved to the Kelly ranch three miles west. These were the dirty 30’s and making a living was pretty tough. Martin worked with the WPA building dikes on the river near Wheeler and building the roads near home. In 1935 they moved to a farm in Hamilton Township and in 1954 they moved northwest of Platte to farm and to take care of Jennie’s father. Two daughters, Berniece and Helen, were born to Martin and Anna while living in Hamilton Township. Martin caught whooping cough when his children were ill and suffered asthma the rest of his life. He liked to play ball and was a pretty fair left handed pitcher until the whooping cough bout. He farmed with his son from 1954 until 1968 when he sold his share of the farm in Hamilton Township to his son John. Martin (Mert) and Jennie Koopal’s children are: John married Gloria Steckley, daughter of Adolph and Elsie (Drury) Steckley of Geddes, South Dakota, in 1954 and their three children are Rhonda, Tim and Sandra. Anna married Eugene Vanderheiden, son of Emil and Anna (Pekoske) Vanderheiden, on June 1, 1951 and they have one son Allen. Berniece married James Wesseling, son of Mr. and Mrs. Harold Wesseling of New Holland, South Dakota, in 1954 and their children are Carmen, Brenda, Lorna, and Mike. Helen married Harlin Mesman, son of Mr. and Mrs. John Mesman, in 1960 and their children are Donna, Dale, Darrin and Darla. John, Anna, and Helen all live in the Platte area and Berniece lives at Chamberlain. Martin (Mert) died March 25, 1970 with complications of asthma, emphysema and a heart condition. starting school with new shoes in the fall. It was fun to run in the fine silt that blew into the fence rows but he almost burned his feet in the hot dirt. After eight years of school in the schoolhouse on the corner, John went to work helping his Dad and neighbors when they needed help. In 1951 he joined the United States Marines and served as a mechanic in Japan and Korea. After returning home he farmed the home place, living on this farm since 1935. John married Gloria Steckley, daughter of Adolph and Elsie (Drury) Steckley, in 1954 and they have raised their family on this farm. Rhonda was born March 9, 1955, and completed all of her grade school in same school as her Dad. Rhonda was active in the 4-H and likes to groom and show cattle and did show a reserve champion home grown Steer at Achievement Days. Tim was born December 15, 1957, and is mentally handicapped but likes to help where possible. He is at the Adjustment Training Center at Mitchell, South Dakota. Sandra was born April 17, 1%3, and attended three years of country school in the same school as her Dad, until it closed in 1972 and then she went to Platte public. She was also active in 4.H. In livestock she showed a reserve and champion steer. She won the best in the class rosette in arts and crafts six out Of seven years (county level) and finally won a trip to 4.H Congress in Chicago for her wood science project in 1982. Sandra is currently attending South Dakota State University at Brookings, South Dakota. John and Gloria irrigated their farm in 1970 and pioneered the high lift irrigation in South Dakota. They had the highest lift in South Dakota for first year. After that many irrigation systems have lifts even higher. John and Gloria have both been active in 4.H while their children were 4.H and since. Gloria recalls some of her school days going to school in Jackson No. 3 west of Geddes. Her first teacher, Mrs. Emily Meade Riley stayed in the schoolhouse with her dog. Airplanes were few those days but when one new over, Mrs. Riley’s dog let them know and all would go Outside and look at the plane. The skunks bumped their heads when they ran around under the schoolhouse floor. Some days the school did not smell so good either. Gloria went her last year at country school with just her brother and sister and then finished in Geddes. was born January 17, 1884, raised, educated, and married in Vrouwenparochie, Friesland, the Netherlands. His wife was Sieske Appeldoorn who was born July 2, 188 in the Netherlands. His father, a farmer, owned a freight business where he hauled products from the larger cities to the smaller towns in Holland. The family sailed to America in 1923 and came directly to Charles Mix County, South Dakota. They tarried a time With the Sjoerd Idema family who lived seven and one half miles southeast of Platte. This is now owned by the DeHaan Grain and Livestock operation. They began farming and lived on farms in Lake George, Platte, Hamilton, and Darlington Townships. Sjoerd and Sieske Koopal retired into Platte around 1949, when Sjoerd became ill and passed away September 11, 1949. Mrs. Koopal remained in her little home in Platte until just a couple months before her passing in the Good Samaritan Home in Corsica, March 3, 1%7. Both are buried in the new Platte City Cemetery. Their four children were all born in the Netherlands and came with them to America in 1923; Martin, Piet (1911-1933), Sybrand and Marie. was born in Holland (Vrouwenparochie, Friesland) September 30, 1911. At the age of nine years he came to America with his parents and family. He was educated in the country schools around the area Where they lived. When a young man he worked for different farmers. In 1936 he went to Artesia, California, for work and stayed with friends, the Rene Cnossen’s. He obtained milking jobs, and February 1941 he enlisted in the United States Army. He met and was engaged to Grace Schnap of paramount, California while he was stationed in Ft. Lewis, Washington. They decided to be married October 16. 1942. Silas finished his Army service in November 1943 and they returned to California. In 1946 they bought a dairy in Downey, California; in 1964 they moved to Chino Valley where they built up a new dairy. Silas and Grace are retired but still live on their dairy. Their son lives on the dairy also, and has taken over the operation. Silas and Grace have three children: George Koopal (1954) is unmarried and is a self. employed automotive machinist. Clarence Koopal (1956) married Roberta Benson; three children, Christy , Kellie, and Kimberly. Alice Koopal (1957) married Don Heida; two children, David and Daniel. They are in the dairy California. was born in 1920 in Holland parochie, the Netherlands) to Sjoerd and Sieske she came with her parents and brothers to America and settled with them in Charles Mix County, South Dakota Marie attended country grade school and graduated from Platte High School in 1938. At the Sacred Heart Nursing School, Yankton, South Dakota, she became a Graduate nurse in 1941. Marie worked for one years as a Registered Nurse in Racine, Wisconsin, and joined the United states Army Nurse Corp for five years where she served in the States and the European theatres. Marie Koopal married Jack C Borel, M.D., in 1946. They had three children: Susan Borel (1948) is a graduate Of San Diego State University a Bachelor of Science degree in nursing. She married Michael Datlow, M.D. Betty Borel (1949) is a graduate of San Diego State University with a Bachelor of Science in nursing She married Douglas Hill and they have three children Jennifer, Michael and Noelle, John Borel (1952) is a graduate of the University of California, Los Angles. and southern California southern California University doctorate degree in dentistry. He married Barbara Young. was born May 2, 1910, to Sjoerd and Sieske (Appeldoorn) Koopal at Vrouwenparochie, Friesland the Netherlands. He attended elementary school in the Netherlands, through the sixth grade. At the age of thirteen years, in September 1923, he came with his parents to America, coming directly to Charles Mix County where they settled on a farm northwest of Platte. As a young he worked for Mr. and Mrs. Wm. DeHaan south of Platte. John DeHaan, living nearby, advised Martin to go to school and learn the American language. He did got school, starting at the first grade and taking several grades in a year until he completed all eight grades. He then went back home and helped his father farm, as by this time he was well established. In 1935 he met a fine girl, Elizabeth Keegal and after two years Of courtship they were married, March 41937. Elizabeth Keegal was born April 12, 1915, to John and Katie (Plooster) Keegal, who lived three miles south of Joubert, on the Burgy farm. When Elizabeth was only 3 years old her father passed away. Two years later her mother married Gerrit Von Eye, who had just come to America from the Netherlands in 1920. The family of Gerrit Von Eye with John and Elizabeth Keegal went to live a farm six and one-half miles southeast Of Platte. 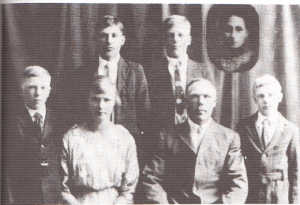 Elizabeth attended the Warejcka School in Rhoda Township, Gerrit and Katie Von Eye had eight sons and two daughters. John and Elizabeth Keegal accompanied peter DeWaard to Idaho to look for employment in the depression years of 1934 and 1935. John earned enough money to buy a Ford Coupe car in which they returned to the Platte area and have lived there since. It was at this time that Elizabeth and Martin met and were married March 4, 1937, after two years Of courtship. They rented the Joseph Anderson farm in Hamilton Township, and lived there nine years. They enjoyed their Norwegian neighbors, having get-together helping and working together. Here three Children were born to the Koopals: Kathleen in 1938. When Martin informed his neighbor lady, Mrs. Pearl Cooley, she congratulated him and asked the name of the new baby girl. Martin said, “it’s something like “gaselene”. Mrs. Cooley said that didn’t sound right, finally they figured it out that it was Kathleen. In 1939 a son Sherman was born; and in 1943 Robert John joined the happy, busy family. It was winter and cold, The baby was born in the kitchen by the c00kstove. Mrs. George Tucker was the nurse and Dr. Mills came, his bill was $25. In 1944 Kathleen started school with Donna Paulson as teacher; the next year Sherman started and then Marie Turgeon was the teacher. The Koopals were a busy family with their three children. They raised chickens and turkeys, milked cows, and tended a large garden. Saturday nights were special. Everybody went to town at night to hear the high school band play, visit friends and neighbors, and “do our trading”, which included selling eggs and cream, buying groceries, clothes, and all necessities. In 1946 Buster Vander Boom sold Martin and Elizabeth the Wheelright farm in Douglas County, ten miles east of Platte. The Kryn Bok’s lived there. The good neighbors of Hamilton Township helped the Koopals move to their newly purchased farm. They were now in Dutch territory, and had to make new acquaintances. In 1950 another son, Cecil John, was born to the Koopals in July 21. The Koopal children attended a Clark Township school in Douglas County, the Schanche-Arntson School, taught by Ruth Holland. The Koopals lived on their farm for thirty-three years. They purchased a house in Platte from Mr. and Mrs, Frank Duba and moved there in 1979. Martin works at the international Implement Company five days a week. He is also a lay preacher in churches to replace the pastor who is gone on vacation, teaches Sunday school, and leads Bible class on Wednesday evenings during the winter months. The Koopals are faithful members of the First Reformed Church of Platte and members of the Platte Gideon Camp. Martin has served on school boards and the F.H.A. board in Douglas County. Mrs. Koopal keeps boarders and baby sits, as well as holding many business positions. (May 21, 1938) married Donald Menning. Kathleen taught school before her marriage. They are farming and dairying at Corsica, South Dakota. They have four children: Dianne (1960) married Ronald Larson (1958) and they have two children, Ryan (1980) and Rachel (1982). Kevin (October 30, 1961) married Susan Fisher and they have son, Nickolas (1982). Frank was born March 5, 1965. Donald was bringing Kathleen to the Platte Hospital for the approaching birth of Frank, a storm moved in before they could reach Platte from Corsica. They went off the road about six miles east of town. Donald walked to the Frank Bechen farm home for help. With much difficulty they got Kathleen to the Bechen house. In order to get Dr. Mills out, a snowplow went ahead and another behind. Dr. Mills arrived time to deliver a baby boy to the Mennings. Later Kathleen and her infant were removed to the hospital. The baby boy was given the name of “Frank” for Frank Bechen who did not have a son, and after his grandfather, Frank Menning. Scott was born October 29, 1968.
was born October 24, 1939. Sherman entered the United States Army at Fort Lewis, Washington. He served in Korea during 1957-58. While stationed at Fort Lewis, Sherman and Vonnie Hubers were married in the Army chapel at Tacoma, Washington, July 20, 1957. They had four children: Vonnie Sue (1958) married Kenneth Schulte and they had two children, Emelle Rose (1980) and Arron Elizabeth (1982). Tammie (1962); Todd Allen (1964); and Lesa Marie (1970). was born February 1, 1943. He served in the National Guard for six months during 1960 at Ft. Leonordwood, Missouri. He married Ruth Hubers (1943). Robert is a trucker in Rapid City and Ruth works for a freight company as manager and bookkeeper. They have two children, Robert (1966) and Sandra (1970). was born July 21, 1950. He married Darlene Teeslink (1950) and they have two children, Chad (1968) and Tracy Lynne (1974). They farm the Martin Koopal farm ten miles east of Platte.